Many of us, no doubt, have hear d or read ministry from the Old Testament on the subject of the Tabernacle. A study of its construction can be a most rewarding exercise, pointing us, as it does in so many of its features, to our Lord Jesus Christ. Another subject that is not considered so often is the Temple, yet this too can be an extremely fascinating topic to examine. As the Lord Jesus left the Temple in Jerusalem, His disciples drew His attention to its remarkable architecture. Truly, it was one of the wonders of the world in its time! Taken up by its sparkling beauty as it glistened in the sunlight, they exclaimed, “Master, see what manner of stones and what buildings are here!” (Mk.13:1). This was Herod’s Temple that had already taken 46 years to build – and still it was not finished! Perhaps to their surprise, the Lord Jesus did not seem as impressed as they were. The history of the Temple was a sad one. 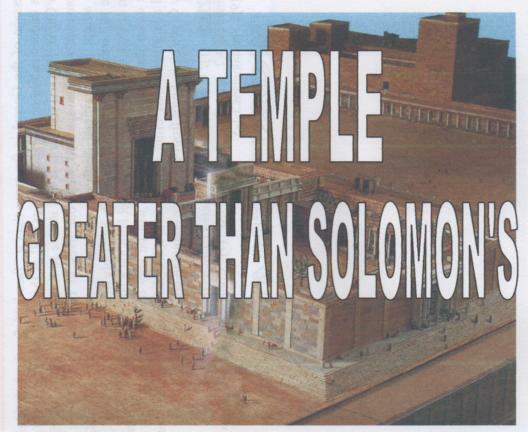 Solomon’s Temple, built almost a thousand years before, had taken seven years to complete and had stood in its glory for more than 350 years. In 586BC Nebuchadnezzar and his armies from Babylon had attacked Jerusalem and destroyed its temple. There was great joy later in the same century when Cyrus issued a decree that the temple should be rebuilt, but many of the older people who saw the temple completed under Zerubbabel’s leadership felt deeply saddened, realizing that it did not possess the glory of the temple built by Solomon (Haggai 2:3). King Herod had virtually rebuilt Zerubbabel’s Temple, adorning it with costly stones (Lk.21:5). Surveying this impressive splendour, the Lord Jesus told His incredulous disciples that not one stone would be left upon another (Mk.13:2). He knew that the Romans would destroy the city and temple, and His words were fulfilled with absolute precision in AD70. Solomon’s Temple had been grand, but One “greater than Solomon” was there, and the Lord Jesus could look ahead to a greater temple than Solomon’s – a “holy temple in the Lord” (Eph.2:21). This building would not be constructed of literal stones but would comprise people – described as “living stones” (1 Pet.2:5). Unlike Solomon’s temple, or any later one, this temple is indestructible. For almost 2,000 years Christ has been building His Church which will be displayed to all, one day, in magnificent glory. For every building project an architect, a builder, and a construction team are needed. The building of Solomon’s Temple was no exception – and we find the same true in the building of the Church of our Lord Jesus Christ. As we consider the erecting of Solomon’s Temple in the light of New Testament teaching, many fascinating truths can be revealed to us. When we turn to 2 Samuel, chapter 7, we discover that the architect of Solomon’s Temple was his father, King David. It was his desire to build a temple for the glory of God and, although not permitted to do so, his desire was one that God appreciated (2 Chr.6:8). In the New Testament we find that God is a Person with desires too. He is not willing that any should perish and longs to deliver sinners from this present evil world (Gal.1:4). With a desire in his heart, an architect commences his design. In 1 Chronicles 28 we read of all the effort that King David put into planning for the construction of that first temple. After considerable thought, he called his son Solomon and gave him “the pattern” that he was to follow – a pattern that God Himself had revealed to David (v.11-19). In addition to this, David prepared gold, silver, iron, and cedar wood, because he intended the temple to be a magnificent structure displaying something of God’s “fame” and “glory” (1 Chr.22:3-5). As we turn to the New Testament we discover that God also had a design. The Apostle Paul tells us in Ephesians that he was given special revelation of the glorious plan and purpose of God that had been hidden from eternity past. God’s plan went beyond the bounds of Israel and encompassed the Gentiles who had previously been without hope. Through the riches of His grace they were also to be saved, made holy, and prepared for glory. The gold that King David prepared surely reminds us of Christ who indwells us and is “the hope of glory” (Col.1:27). Every architect, having drawn up his plans, must designate someone to carry out the task. King David designated Solomon (who was God’s choice) as we see in 1 Chronicles 28:9-10. Similarly, God had only one Person in mind to carry out His work as Builder of the Church. The opening verses of Hebrews present to us His glorious Son, sent from heaven to complete the vital work of redemption that could have been undertaken by nobody else. Each builder, receiving his instructions from the architect, must have a purpose. Solomon’s words of intent were: “I purpose to build an house unto the name of the LORD my God” (1 Kgs.5:5). The One who is “greater than Solomon” declared with certainty when on earth, “I will build my Church” (Mt.16:18). He was a greater Person, and His work was so much greater for “the gates of hell” would never prevail against His Church. It would stand firm for eternity! No nation, world power, or demonic force could possibly succeed against Him! Already we have seen that David had made preparation in his lifetime. This, however, was not enough, for Solomon wrote to Hiram, King of Tyre, asking him to cut down some of his finest cedars in order that God’s house could be built. As we relate this to our Lord Jesus Christ we see at once a striking similarity. The prophet had declared that He would be “cut off out of the land of the living” (Isa.53:8), speaking of a violent death. It is sobering to think that before the Church could be built the Lord Jesus had to be “cut down” like the fine cedars of Lebanon and suffer the awful agony of the cross. How we should praise Him for His great grace in becoming poor and in stooping so low in order that we could be saved! Further details given in 1 Kings 5:13-16 show us the personnel appointed by Solomon. There were carriers, stonecutters, foremen, as well as the skilled servants of Hiram who were employed in felling the cedar trees. Yet all the time Solomon remained the builder. He “commanded” (1 Kgs. 5:17), he “began to build the house of the LORD” (1 Kgs.6:1), and eventually “he built the house, and finished it” (1 Kgs.6:9). When the Lord Jesus ascended to heaven He appointed His workmen and “gave gifts unto men” (Eph.4:8). Apostles, prophets, evangelists, pastors, and teachers were all to share in different ways in the work of building the Church; but, like Solomon, the Lord Jesus remained the great “Master Builder” – in complete control and fully responsible for everything. The apostles and prophets of the early Church era laid the foundation, as we also read in Ephesians 2:20. Their ministry was completed long ago. Upon this firm foundation the framework of the building was placed. In Solomon’s time, his workmen used “timber and stones” (1 Kgs.5:18) – each stone being cut to shape in the quarry (1 Kgs.6:7). Today building sites are often some of the noisiest places imaginable, yet here in Jerusalem not a sound was to be heard! In the same way now the Lord Jesus is quietly building His Church. From the dark quarries of sin and shame, stones are being lifted. They have no life but miraculously are brought into contact with “the Living Stone” and at once become “living stones” too (1 Pet.2:4-5). Each precious soul thus converted is added to this “holy temple in the Lord” (Eph.2:21) which is expanding all the time as it moves towards completion. 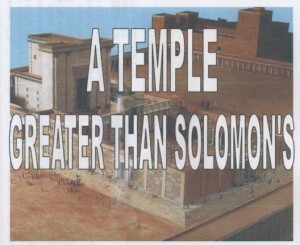 The function of Solomon’s Temple was to be a “house for the name of the LORD God of Israel” (1 Kgs.8:20). He was to dwell there, and the glory cloud that filled the house was the very proof of His presence. Similarly, the Church is to be a “habitation of God through the Spirit” (Eph.2:22). He does not dwell in temples made with hands today, we learn from Acts 7:48, but in the midst of His people. How vital it is therefore that we should live holy lives as we reflect upon this very wonderful truth. Cologne Cathedral was commenced in 1248, and building work continued until it was halted in 1473. It was not until 1842 that work resumed, and the project was finally completed in 1880. During the latter years of construction, the building itself was obscured by scaffolding, but only when the work was finished and the scaffolding was removed could the magnificence of the cathedral really be appreciated. Today the Lord Jesus is building His Church. We are not really conscious of its glory, for the scaffolding of man hides its splendour from our view. One day the last stone will be added to the building, the scaffolding will be removed, the Lord will come, and the Church will be displayed “having the glory of God” (Rev.21:11). How much greater this will be than the glory of the finest earthly cathedral designed by man! Every conversion should thrill us and cause us to rejoice that another stone has been added to the building. When the building is completed, every one who sees it will recognize that all the glory is God’s and will exclaim, “This is the LORD’S doing; it is marvellous in our eyes!” (Ps.118:23). Until then we must labour with untiring zeal, that the Lord may use us as members of His construction team to add further stones to His building while we wait for the glad day of His return. The hymn below is a fitting conclusion to this interesting subject. Which rests upon the “Living Stone”. And build on Christ, the “Living Stone”. He gave Himself, the “Living Stone”.